To report SUSPECTED ADVERSE REACTIONS, contact Gilead Sciences, Inc., at 1-800-GILEAD-5 or FDA at 1-800-FDA-1088 or www.fda.gov/medwatch. Ranexa is indicated for the treatment of chronic angina. Ranexa may be used with beta-blockers, nitrates, calcium channel blockers, anti-platelet therapy, lipid-lowering therapy, ACE inhibitors, and angiotensin receptor blockers. Initiate Ranexa dosing at 500 mg twice daily and increase to 1000 mg twice daily, as needed, based on clinical symptoms. Take Ranexa with or without meals. Swallow Ranexa tablets whole; do not crush, break, or chew. The maximum recommended daily dose of Ranexa is 1000 mg twice daily. If a dose of Ranexa is missed, take the prescribed dose at the next scheduled time; do not double the next dose. Dose adjustments may be needed when Ranexa is taken in combination with certain other drugs [see Drug Interactions (7.1)]. Limit the maximum dose of Ranexa to 500 mg twice daily in patients on diltiazem, verapamil, and other moderate CYP3A inhibitors. Down-titrate Ranexa based on clinical response in patients concomitantly treated with P-gp inhibitors, such as cyclosporine. Ranolazine blocks IKr and prolongs the QTc interval in a dose-related manner. Clinical experience in an acute coronary syndrome population did not show an increased risk of proarrhythmia or sudden death [see Clinical Studies (14.2)]. However, there is little experience with high doses (> 1000 mg twice daily) or exposure, other QT-prolonging drugs, or potassium channel variants resulting in a long QT interval. A total of 2,018 patients with chronic angina were treated with ranolazine in controlled clinical trials. Of the patients treated with Ranexa, 1,026 were enrolled in three double-blind, placebo-controlled, randomized studies (CARISA, ERICA, MARISA) of up to 12 weeks duration. In addition, upon study completion, 1,251 patients received treatment with Ranexa in open-label, long-term studies; 1,227 patients were exposed to Ranexa for more than 1 year, 613 patients for more than 2 years, 531 patients for more than 3 years, and 326 patients for more than 4 years. At recommended doses, about 6% of patients discontinued treatment with Ranexa because of an adverse event in controlled studies in angina patients compared to about 3% on placebo. The most common adverse events that led to discontinuation more frequently on Ranexa than placebo were dizziness (1.3% versus 0.1%), nausea (1% versus 0%), asthenia, constipation, and headache (each about 0.5% versus 0%). Doses above 1000 mg twice daily are poorly tolerated. In controlled clinical trials of angina patients, the most frequently reported treatment-emergent adverse reactions (> 4% and more common on Ranexa than on placebo) were dizziness (6.2%), headache (5.5%), constipation (4.5%), and nausea (4.4%). Dizziness may be dose-related. In open-label, long-term treatment studies, a similar adverse reaction profile was observed. Other (< 0.5%) but potentially medically important adverse reactions observed more frequently with Ranexa than placebo treatment in all controlled studies included: angioedema, renal failure, eosinophilia, blurred vision, confusional state, hematuria, hypoesthesia, paresthesia, tremor, pulmonary fibrosis, thrombocytopenia, leukopenia, and pancytopenia. A large clinical trial in acute coronary syndrome patients was unsuccessful in demonstrating a benefit for Ranexa, but there was no apparent proarrhythmic effect in these high-risk patients [see Clinical Trials (14.2)]. Ranexa produces small reductions in hemoglobin A1c. Ranexa is not a treatment for diabetes. Ranexa produces elevations of serum creatinine by 0.1 mg/dL, regardless of previous renal function. The elevation has a rapid onset, shows no signs of progression during long-term therapy, is reversible after discontinuation of Ranexa, and is not accompanied by changes in BUN. In healthy volunteers, Ranexa 1000 mg twice daily had no effect upon the glomerular filtration rate. The elevated creatinine levels are likely due to a blockage of creatinine's tubular secretion by ranolazine or one of its metabolites. Ranolazine is primarily metabolized by CYP3A and is a substrate of P-glycoprotein (P-gp). Do not use Ranexa with strong CYP3A inhibitors, including ketoconazole, itraconazole, clarithromycin, nefazodone, nelfinavir, ritonavir, indinavir, and saquinavir. Ketoconazole (200 mg twice daily) increases average steady-state plasma concentrations of ranolazine 3.2-fold [see Contraindications (4)]. Limit the dose of Ranexa to 500 mg twice daily in patients on moderate CYP3A inhibitors, including diltiazem, verapamil, aprepitant, erythromycin, fluconazole, and grapefruit juice or grapefruit-containing products. Diltiazem (180â€“360 mg daily) and verapamil (120 mg three times daily) increase ranolazine steady-state plasma concentrations about 2-fold [see Dosage and Administration (2.2)]. Weak CYP3A inhibitors such as simvastatin (20 mg once daily) and cimetidine (400 mg three times daily) do not increase the exposure to ranolazine in healthy volunteers. Down-titrate Ranexa based on clinical response in patients concomitantly treated with P-gp inhibitors, such as cyclosporine [see Dosage and Administration (2.2)]. Avoid co-administration of Ranexa and CYP3A inducers such as rifampin, rifabutin, rifapentin, phenobarbital, phenytoin, carbamazepine, and St. John's wort. Rifampin (600 mg once daily) decreases the plasma concentration of ranolazine (1000 mg twice daily) by approximately 95% by induction of CYP3A and, probably, P-gp. The potent CYP2D6 inhibitor, paroxetine (20 mg once daily), increases ranolazine concentrations 1.2-fold. No dose adjustment of Ranexa is required in patients treated with CYP2D6 inhibitors. Digoxin (0.125 mg) does not significantly alter ranolazine levels. In vitro studies indicate that ranolazine and its O-demethylated metabolite are weak inhibitors of CYP3A, moderate inhibitors of CYP2D6 and moderate P-gp inhibitors. Ranolazine and its most abundant metabolites are not known to inhibit the metabolism of substrates for CYP 1A2, 2C8, 2C9, 2C19, or 2E1 in human liver microsomes, suggesting that ranolazine is unlikely to alter the pharmacokinetics of drugs metabolized by these enzymes. The plasma levels of simvastatin, a CYP3A substrate, and its active metabolite are each increased about 2-fold in healthy subjects receiving simvastatin (80 mg once daily) and Ranexa (1000 mg twice daily). Dose adjustments of simvastatin are not required when Ranexa is co-administered with simvastatin. The pharmacokinetics of diltiazem is not affected by ranolazine in healthy volunteers receiving diltiazem 60 mg three times daily and Ranexa 1000 mg twice daily. Ranexa (1000 mg twice daily) causes a 1.5-fold elevation of digoxin plasma concentrations. The dose of digoxin may have to be adjusted. Ranolazine or its metabolites partially inhibit CYP2D6. There are no studies of concomitant use of Ranexa with other drugs metabolized by CYP2D6, such as tricyclic antidepressants and antipsychotics, but lower doses of CYP2D6 substrates may be required. In animal studies, ranolazine at exposures 1.5 (rabbit) to 2 (rat) times the usual human exposure caused maternal toxicity and misshapen sternebrae and reduced ossification in offspring. These doses in rats and rabbits were associated with an increased maternal mortality rate [see Reproductive Toxicology Studies (13.3)]. There are no adequate well-controlled studies in pregnant women. Ranexa should be used during pregnancy only when the potential benefit to the patient justifies the potential risk to the fetus. It is not known whether ranolazine is excreted in human milk. Because many drugs are excreted in human milk and because of the potential for serious adverse reactions from ranolazine in nursing infants, decide whether to discontinue nursing or to discontinue Ranexa, taking into account the importance of the drug to the mother. Of the chronic angina patients treated with Ranexa in controlled studies, 496 (48%) were â‰¥ 65 years of age, and 114 (11%) were â‰¥ 75 years of age. No overall differences in efficacy were observed between older and younger patients. There were no differences in safety for patients â‰¥ 65 years compared to younger patients, but patients â‰¥ 75 years of age on ranolazine, compared to placebo, had a higher incidence of adverse events, serious adverse events, and drug discontinuations due to adverse events. In general, dose selection for an elderly patient should usually start at the low end of the dosing range, reflecting the greater frequency of decreased hepatic, renal, or cardiac function, and of concomitant disease, or other drug therapy. Ranexa is contraindicated in patients with clinically significant hepatic impairment. Plasma concentrations of ranolazine were increased by 30% in patients with mild (Child-Pugh Class A) and by 60% in patients with moderate (Child-Pugh Class B) hepatic impairment. This was not enough to account for the 3-fold increase in QT prolongation seen in patients with mild to severe hepatic impairment [see Contraindications (4)]. In patients with varying degrees of renal impairment, ranolazine plasma levels increased up to 50%. The pharmacokinetics of ranolazine has not been assessed in patients on dialysis. Heart failure (NYHA Class I to IV) had no significant effect on ranolazine pharmacokinetics. Ranexa had minimal effects on heart rate and blood pressure in patients with angina and heart failure NYHA Class I to IV. No dose adjustment of Ranexa is required in patients with heart failure. A population pharmacokinetic evaluation of data from angina patients and healthy subjects showed no effect of diabetes on ranolazine pharmacokinetics. No dose adjustment is required in patients with diabetes. Ranexa produces small reductions in HbA1c in patients with diabetes, the clinical significance of which is unknown. Ranexa should not be considered a treatment for diabetes. High oral doses of ranolazine produce dose-related increases in dizziness, nausea, and vomiting. High intravenous exposure also produces diplopia, paresthesia, confusion, and syncope. In addition to general supportive measures, continuous ECG monitoring may be warranted in the event of overdose. Since ranolazine is about 62% bound to plasma proteins, hemodialysis is unlikely to be effective in clearing ranolazine. 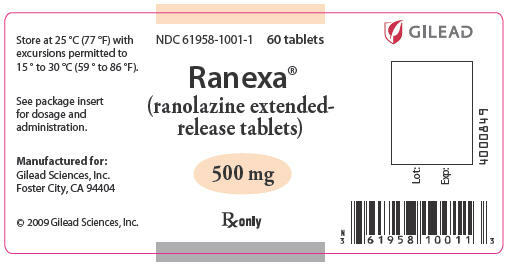 Ranexa (ranolazine) is available as a film-coated, non-scored, extended-release tablet for oral administration. Ranolazine is a white to off-white solid. Ranolazine is soluble in dichloromethane and methanol; sparingly soluble in tetrahydrofuran, ethanol, acetonitrile, and acetone; slightly soluble in ethyl acetate, isopropanol, toluene, and ethyl ether; and very slightly soluble in water. Ranexa tablets contain 500 mg or 1000 mg of ranolazine and the following inactive ingredients: carnauba wax, hypromellose, magnesium stearate, methacrylic acid copolymer (Type C), microcrystalline cellulose, polyethylene glycol, sodium hydroxide, and titanium dioxide. Additional inactive ingredients for the 500 mg tablet include polysorbate 80 and FD&C Yellow No. 6 Lake; additional inactive ingredients for the 1000 mg tablet include lactose monohydrate, triacetin, and Iron Oxide Yellow. The mechanism of action of ranolazine's antianginal effects has not been determined. Ranolazine has anti-ischemic and antianginal effects that do not depend upon reductions in heart rate or blood pressure. It does not affect the rate-pressure product, a measure of myocardial work, at maximal exercise. Ranolazine at therapeutic levels can inhibit the cardiac late sodium current (INa). However, the relationship of this inhibition to angina symptoms is uncertain. The QT prolongation effect of ranolazine on the surface electrocardiogram is the result of inhibition of IKr, which prolongs the ventricular action potential. Patients with chronic angina treated with Ranexa in controlled clinical studies had minimal changes in mean heart rate (< 2 bpm) and systolic blood pressure (< 3 mm Hg). Similar results were observed in subgroups of patients with CHF NYHA Class I or II, diabetes, or reactive airway disease, and in elderly patients. Dose and plasma concentration-related increases in the QTc interval [see Warnings and Precautions (5.1)], reductions in T wave amplitude, and, in some cases, notched T waves, have been observed in patients treated with Ranexa. These effects are believed to be caused by ranolazine and not by its metabolites. The relationship between the change in QTc and ranolazine plasma concentrations is linear, with a slope of about 2.6 msec/1000 ng/mL, through exposures corresponding to doses several-fold higher than the maximum recommended dose of 1000 mg twice daily. The variable blood levels attained after a given dose of ranolazine give a wide range of effects on QTc. At Tmax following repeat dosing at 1000 mg twice daily, the mean change in QTc is about 6 msec, but in the 5% of the population with the highest plasma concentrations, the prolongation of QTc is at least 15 msec. In subjects with mild or moderate hepatic impairment, the relationship between plasma level of ranolazine and QTc is much steeper [see Contraindications (4)]. Age, weight, gender, race, heart rate, congestive heart failure, diabetes, and renal impairment did not alter the slope of the QTc-concentration relationship of ranolazine. No proarrhythmic effects were observed on 7-day Holter recordings in 3,162 acute coronary syndrome patients treated with Ranexa. There was a significantly lower incidence of arrhythmias (ventricular tachycardia, bradycardia, supraventricular tachycardia, and new atrial fibrillation) in patients treated with Ranexa (80%) versus placebo (87%), including ventricular tachycardia â‰¥ 3 beats (52% versus 61%). However, this difference in arrhythmias did not lead to a reduction in mortality, a reduction in arrhythmia hospitalization, or a reduction in arrhythmia symptoms. Ranolazine is extensively metabolized in the gut and liver and its absorption is highly variable. For example, at a dose of 1000 mg twice daily, the mean steady-state Cmax was 2600 ng/mL with 95% confidence limits of 400 and 6100 ng/mL. The pharmacokinetics of the (+) R- and (-) S-enantiomers of ranolazine are similar in healthy volunteers. The apparent terminal half-life of ranolazine is 7 hours. Steady state is generally achieved within 3 days of twice-daily dosing with Ranexa. At steady state over the dose range of 500 to 1000 mg twice daily, Cmax and AUC0â€“Ï„ increase slightly more than proportionally to dose, 2.2- and 2.4-fold, respectively. With twice-daily dosing, the trough:peak ratio of the ranolazine plasma concentration is 0.3 to 0.6. The pharmacokinetics of ranolazine is unaffected by age, gender, or food. After oral administration of Ranexa, peak plasma concentrations of ranolazine are reached between 2 and 5 hours. After oral administration of 14C-ranolazine as a solution, 73% of the dose is systemically available as ranolazine or metabolites. The bioavailability of ranolazine from Ranexa tablets relative to that from a solution of ranolazine is 76%. Because ranolazine is a substrate of P-gp, inhibitors of P-gp may increase the absorption of ranolazine. Food (high-fat breakfast) has no important effect on the Cmax and AUC of ranolazine. Therefore, Ranexa may be taken without regard to meals. Over the concentration range of 0.25 to 10 µg/mL, ranolazine is approximately 62% bound to human plasma proteins. Ranolazine is metabolized mainly by CYP3A and, to a lesser extent, by CYP2D6. Following a single oral dose of ranolazine solution, approximately 75% of the dose is excreted in urine and 25% in feces. Ranolazine is metabolized rapidly and extensively in the liver and intestine; less than 5% is excreted unchanged in urine and feces. The pharmacologic activity of the metabolites has not been well characterized. After dosing to steady state with 500 mg to 1500 mg twice daily, the four most abundant metabolites in plasma have AUC values ranging from about 5 to 33% that of ranolazine, and display apparent half-lives ranging from 6 to 22 hours. Ranolazine tested negative for genotoxic potential in the following assays: Ames bacterial mutation assay, Saccharomyces assay for mitotic gene conversion, chromosomal aberrations assay in Chinese hamster ovary (CHO) cells, mammalian CHO/HGPRT gene mutation assay, and mouse and rat bone marrow micronucleus assays. There was no evidence of carcinogenic potential in mice or rats. The highest oral doses used in the carcinogenicity studies were 150 mg/kg/day for 21 months in rats (900 mg/m2/day) and 50 mg/kg/day for 24 months in mice (150 mg/m2/day). These maximally tolerated doses are 0.8 and 0.1 times, respectively, the maximum recommended human dose (MRHD) of 2 grams on a surface area basis. A published study reported that ranolazine promoted tumor formation and progression to malignancy when given to transgenic APC (min/+) mice at a dose of 30 mg/kg twice daily [see References (15)]. The clinical significance of this finding is unclear. Animal reproduction studies with ranolazine were conducted in rats and rabbits. There was an increased incidence of misshapen sternebrae and reduced ossification of pelvic and cranial bones in fetuses of pregnant rats dosed at 400 mg/kg/day (2 times the MRHD on a surface area basis). Reduced ossification of sternebrae was observed in fetuses of pregnant rabbits dosed at 150 mg/kg/day (1.5 times the MRHD on a surface area basis). These doses in rats and rabbits were associated with an increased maternal mortality rate. CARISA (Combination Assessment of Ranolazine In Stable Angina) was a study in 823 chronic angina patients randomized to receive 12 weeks of treatment with twice-daily Ranexa 750 mg, 1000 mg, or placebo, who also continued on daily doses of atenolol 50 mg, amlodipine 5 mg, or diltiazem CD 180 mg. Sublingual nitrates were used in this study as needed. In this trial, statistically significant (p < 0.05) increases in modified Bruce treadmill exercise duration and time to angina were observed for each Ranexa dose versus placebo, at both trough (12 hours after dosing) and peak (4 hours after dosing) plasma levels, with minimal effects on blood pressure and heart rate. The changes versus placebo in exercise parameters are presented in Table 1. Exercise treadmill results showed no increase in effect on exercise at the 1000 mg dose compared to the 750 mg dose. The effects of Ranexa on angina frequency and nitroglycerin use are shown in Table 2. Tolerance to Ranexa did not develop after 12 weeks of therapy. Rebound increases in angina, as measured by exercise duration, have not been observed following abrupt discontinuation of Ranexa. Ranexa has been evaluated in patients with chronic angina who remained symptomatic despite treatment with the maximum dose of an antianginal agent. In the ERICA (Efficacy of Ranolazine In Chronic Angina) trial, 565 patients were randomized to receive an initial dose of Ranexa 500 mg twice daily or placebo for 1 week, followed by 6 weeks of treatment with Ranexa 1000 mg twice daily or placebo, in addition to concomitant treatment with amlodipine 10 mg once daily. In addition, 45% of the study population also received long-acting nitrates. Sublingual nitrates were used as needed to treat angina episodes. Results are shown in Table 3. Statistically significant decreases in angina attack frequency (p = 0.028) and nitroglycerin use (p = 0.014) were observed with Ranexa compared to placebo. These treatment effects appeared consistent across age and use of long-acting nitrates. Effects on angina frequency and exercise tolerance were considerably smaller in women than in men. In CARISA, the improvement in Exercise Tolerance Test (ETT) in females was about 33% of that in males at the 1000 mg twice-daily dose level. In ERICA, where the primary endpoint was angina attack frequency, the mean reduction in weekly angina attacks was 0.3 for females and 1.3 for males. There were insufficient numbers of non-Caucasian patients to allow for analyses of efficacy or safety by racial subgroup. In a large (n = 6,560) placebo-controlled trial (MERLIN-TIMI 36) in patients with acute coronary syndrome, there was no benefit shown on outcome measures. However, the study is somewhat reassuring regarding proarrhythmic risks, as ventricular arrhythmias were less common on ranolazine [see Clinical Pharmacology (12.2)], and there was no difference between Ranexa and placebo in the risk of all-cause mortality (relative risk ranolazine:placebo 0.99 with an upper 95% confidence limit of 1.22). M.A. Suckow et al. The anti-ischemia agent ranolazine promotes the development of intestinal tumors in APC (min/+) mice. Cancer Letters 209(2004):165âˆ’9. Store Ranexa tablets at 25 °C (77 °F) with excursions permitted to 15 ° to 30 °C (59 ° to 86 °F). To ensure safe and effective use of Ranexa, the following information and instructions should be communicated to the patient when appropriate. Ranexa is a registered U.S. trademark of Gilead, Palo Alto, Inc.